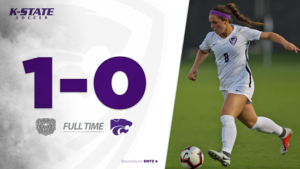 MANHATTAN – Kansas State controlled the action for a majority of the match against Missouri State on Friday night, but the Bears put in a header off a corner in the second half to stun the Wildcats with a 1-0 win at the K-State Soccer Complex. K-State (3-3-2) tallied a 23-2 total shot advantage which included a 9-1 edge in shots on goal, but Missouri State (6-4-0) made its one shot on goal count. The 23 shots for K-State were the second-most of the season, trailing the season-high of 27 against Oakland on August 19. In the 63rd minute, the Bears were awarded the only corner kick for either team in the second half. Jacqueline Baetz put her foot into the ball and found the head of Brittney Robinson inside the six-yard box. Robinson redirected the ball in between the hands of K-State goalkeeper Emma Malsy for the lone goal of the match. K-State had a pair of late attempts to even the match. Brookelynn Entz sent a blistering free kick attempt from 30 yards out in the center of the field. Missouri State goalkeeper Kaitlin Maxwell pushed the ball into the crossbar and the Wildcats were unable to nudge in the rebound. Maxwell finished with nine saves. In the final moments of the match, Morgan Egan crossed a ball into the Missouri State 18-yard box. Egan’s pass fell at the foot of Entz just outside the left post. Entz was unable to get the ball into the net as time expired. Entz finished the night with a team-high eight shot attempts, including three on goal. Kansas State will end its regular season non-conference schedule on Sunday, as the Wildcats travel to face Tulsa for a 2 p.m., kickoff. Sunday’s match will be broadcast online at HurricaneVision (subscription required). The match will also be available for free at kstatesports.com.